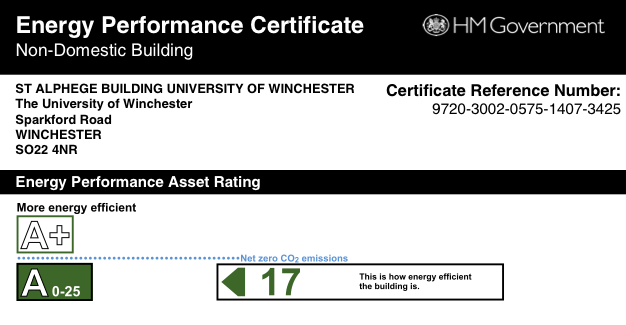 The new St.Alphege learning and teaching building for the University of Winchester has had an Energy Performance Certificate returned this week showing how well the building is performing in terms of it’s building fabric, heating system, ventilation and lighting systems in use. The rating is compared to typical benchmarks for this type of building and has far exceeded average ratings. Achieving a high score of 17 the building scores an ‘A’ rating which achieves all credits needed for BREEAM Ene 01. The University and Design Team are very pleased with the achievement which is further evidence that the University not only has a building that can reduce it’s overall running cost, but can also significantly reduce the impact the building’s operation has on the environment. The recently completed Performing Art’s Faculty also achieved an A rated Energy Performance Certificate with a score of 24, demonstrating Design Engine’s and the Universities’ continued commitment to energy efficient design.